I keep running into this female Eastern box turtle when I am out and about. She is usually out looking for a place to lay her eggs, and because I know that her particular subspecies could become threatened in the near future, I don’t even touch her. At one time in my life, I would have taken her home. Most rural children in my part of the world collect box turtles during the early summer and try to make pets out of them. The truth is that this subspecies, the Eastern box turtle (Terrapene carolina carolina), actually makes a terrible pet. They become deeply attached to their home range, and taking them from their home ranges stresses them so much that they become susceptible to disease and parasites. The Eastern box turtle is a subspecies of the common North American box turtle, which used to range up into Eastern Canada as well as most of the Midwestern and Eastern US. We know only about its range in Canada from remains that have been dated to the sixteenth century, but now it is experiencing lots of problems in its range in the US. In the neighboring state of Ohio, it is a “Species of Concern,” but it is still pretty common here. I’ve seen little, tiny hatchling box turtles that aren’t much bigger than a quarter, but these little turtles aren’t maturing many parts of their range. So I don’t recommend that anyone keep pet Eastern box turtles, especially those from wild populations. Many states ban the practice now. Even if you have a box turtle as a pet, it requires a large enclosure, a high protein diet, and relatively high humidity. But not all box turtles subspecies have the same problem with attachment to their home ranges than the Eastern subspecies has. In the South-Central US. 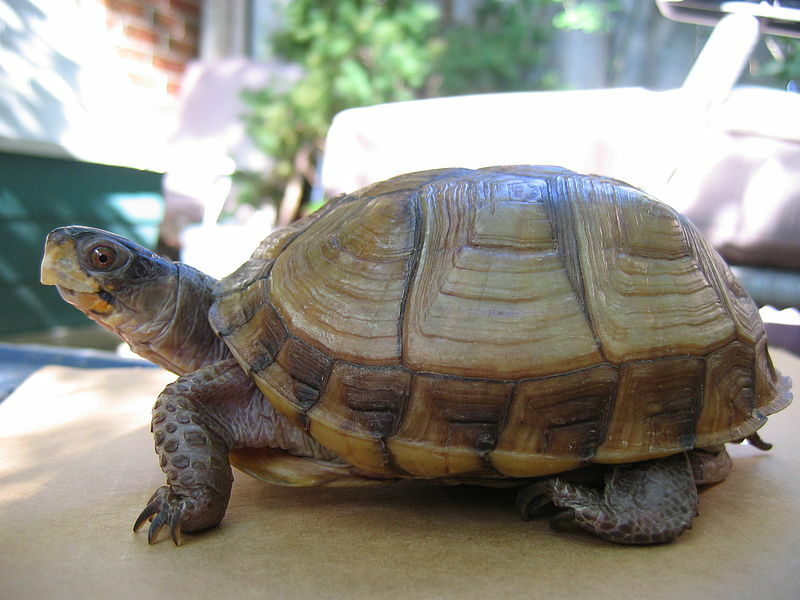 there is another subspecies of the common North American box turtle, which is called the three-toed box turtle (Terrapene carolina triunguis). I first saw these turtles at a pet store in Vienna, West Virginia, and I was amazed at how much they looked like the native subspecies. The main difference was they were mostly chocolate-brown in color and had three-toes on their back feet. I didn’t know at the time, but these three-toed box turtles were being offered as pets simply because they were found to be much better suited to captivity than the Eastern subspecies. They still require the humidity, the large enclosure, and the high protein diet. However, they aren’t as greatly stressed from being removed from their native ranges, and as a result they are much better able to adapt to captive conditions. 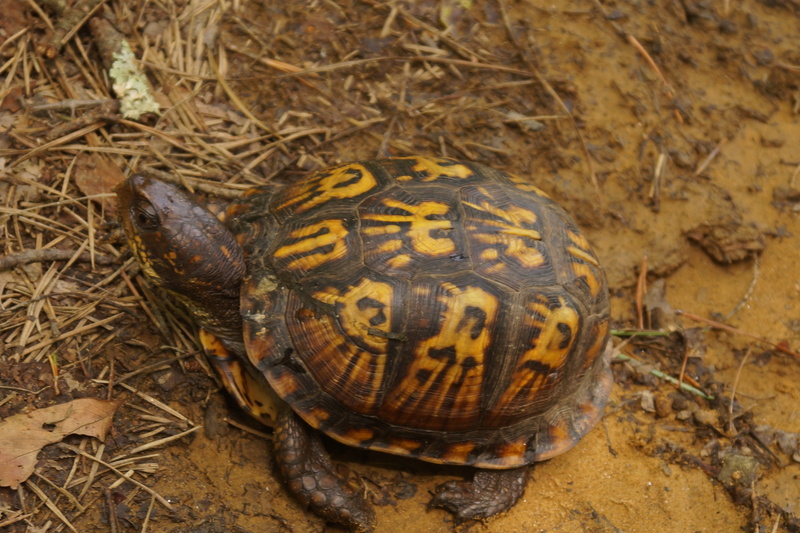 When a three-toed box turtle is released into my part of the world, they often cross with Eastern box turtles. I have often suspected that the Eastern one at the top of this page might be a hybrid, simply because she lacks the extensive yellow markings on the head. But that could simply be a variation in the Eastern subspecies. Whatever the story of these two box turtles is I think they can tell us a lot about how to think of wolves and dogs. Modern wolves are very difficult to domesticate, and they make terrible pets. Dogs, of course, do very well in the human environment. Just like the box turtles, there are minor morphological differences between wolves and the less exaggerated breeds of domestic dog. And when given the opportunity, dogs and wolves exchange genes. I do not know how much DNA Eastern and three-toed box turtles share. My guess is they share far less than dogs and wolves do, simply because dogs and wolves are a highly mobile, relatively large species and species with those characteristics tend to have less diversity as a species. Regional box turtle populations are going to show greater distinctiveness than a wolf or dog population when compared to the entire species. But it’s not controversial that Eastern and three-toed box turtles are just separate subspecies. However, saying the same about dogs and wolves tends to launch people. That’s because there are political and sociological reasons for classifying dogs as a separate species from the wolf, which you can’t say about the two subspecies of box turtle. But if we’re willing to say that these two box turtles are part of a single species, what level of mental gymnastics are we willing to engage in to keep wolves and dogs separate species? I know the answer to that question, I’m afraid. I think it was your blog where I first ran into the idea of dogs being a subspecies vs. separate species. Even being a recent grad with a biology degree didn’t stop me from having a knee-jerk reaction of “dogs aren’t wolves!” Once I focused on the science and less on the romanticism surrounding both dogs and wolves, though, it makes much more sense. Our minds are naturally Linneaen, so it’s really hard for us to classify nature cladistically. Also, I’ll forgive you because at that time, Coppinger’s book was the main source for information about dogs from a science perspective, and even I somewhat was willing to give them species status after the Hungarian cognitive studies came out. Speaking of morphological differences, there are morphological differences between the five subspecies of wildcat. The Chinese Mountain cat is sandy yellow, warm greyish yellow, or reddish grey, with distinct stripes only on the tail, a black tail tip, and very faint stripes everywhere else on its body. They have small tufts on their ears, a stocky body, and a blunt-tipped, thick club-shaped tail. They sometimes have blue eyes. This subspecies used to be considered a different species, as the now invalid taxon, Felis bieti. The Central Asian Wildcat is sandy yellow, greyish yellow, or reddish with distinct spots that sometimes fuse into stripes. They have small tufts on their ears, a moderately slender body, and a rounded-tipped, thin rope-shaped tail. They sometimes have blue eyes. The Southern African Wildcat is faintly to distinctly striped with distinct leg and tail stripes and is either light cool grey (sort of reminiscent of the color of a cantaloupe) or tawny grey (a warmer shade). They have distinctly reddish backed ears, a very slender body, and a rounded-tipped, thin rope-shaped tail. This subspecies used to be lumped in with Near Eastern Wildcat and was called the African Wildcat. The Near Eastern Wildcat is sandy grey, sandy yellow, tawny brown, brownish grey, greyish brown, or reddish and has often indistinct stripes and spots or broken stripes with distinct leg and tail stripes. They have reddish backed ears, a moderately slender body, and a rounded-tipped, thin rope-shaped tail. Their dorsal stripe continues onto the tail. This subspecies is tamable, has adapted to living in agricultural areas and around humans, is less wary of humans, and is the subspecies that has domesticated itself. The European Wildcat is greyish brown, brownish grey, brown, or reddish and has distinct or indistinct widely spaced stripes with a ringed tail and black tail tip. They have a stocky body and a blunt-tipped, thick club-shaped tail. They often have green or bluish green eyes. Their distinct dorsal stripe stops at the base of the tail. The critically endangered Scottish variant, which used to be considered a different subspecies, appears darker-furred, has more distinct stripes, and pencil stripes over its eyes that sort of look like eyebrows. This subspecies is very shy, very avoidant of humans and human influenced environments and is very difficult to tame, even as kittens. Also the Scottish variant is the one wildcat that infamously can’t become tame. Thank you for your comments about the different subspecies of wildcat. It’s very interesting how these animals parallel other domestics. Weren’t domestic dogs reclassified as canis lupus familiaris 20some years ago? Is this really still controversial? I know there are some people who think that dogs basically ARE wolves and they use that as an excuse to use some really outdated training methods (which are based on a complete misunderstanding of wolf behavior and social structure anyway) but I don’t recall hearing a lot of objections to dogs and wolves being different subspecies of the same species. Is this a thing? It is a thing, believe it or not. I’m not going to link to the junk science blogs that say so, but you can find them.